(NaturalNews) The cold and flu season has arrived, and people are already starting to take precautionary measures. There is no need to worry, as the easy solution might just be found in the kitchen or garden. Some easy and effective all natural home remedies that anyone can make anytime have been found effective against the pesky colds and flu. It has been proven that green tea is great for keeping the body healthy, meaning that it keeps the body strong enough to fight colds and flu. While it is not certain how many cups a day one should drink, 2-3 cups are recommended. To get rid of a current cold or flu infection faster, drink 3-4 cups a day instead. This will help give the immune system a boost to fight the invaders, as well as giving the body an extra surge of energy. Ginger has been used for centuries for its medicinal properties. Make fresh ginger tea by steeping slices of ginger into a mug or glass of hot water and sip to soothe sore and scratchy throats and coughs and even give a bit of an energy boost. Honey is known to boost the body's defenses. Taking honey every day will give a person more energy and overall health. Honey can help cure sore throats and coughs due to its antimicrobial and antibacterial properties. Honey can be a sugar or sweetener substitute in drinks such as coffee, tea, juice or even in plain water, or it can be taken as it is. Saltwater mixed with lemon and honey also makes a great mouthwash. Honey should not be given to infants shy of 12 months of age, however. High in immune system-booster vitamin C, lemons and limes weaken the virus and help reduce and loosen phlegm. Squeeze lemon juice into hot or cold tea with honey or make lemonade with honey to keep the sniffles at bay and fight the infection away. They may or may not keep vampires away, but they definitely fend off coughs and colds. 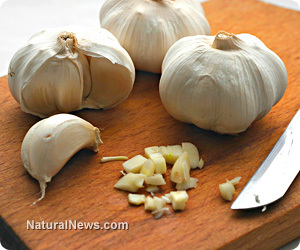 Rich in allicin, which strengthens the immune system, 1-2 pieces of chopped or crushed garlic steeped in hot water can do wonders to relieve the symptoms of flu. Peppermint tea is an all natural expectorant - a cough medicine that helps expel phlegm. It has nutrients that boost the immune system as well. Saline solutions, or water with a bit of salt, have been used in a variety of ways for many years, such as mouthwashes, nasal washes and nasal sprays. Salt water is an effective remedy for sore throats and clogged sinuses. Half a teaspoon of salt with a cup of warm water is a great gargle for sore throats and can be used four times daily. To use as a nasal decongestant, a cup of warm water with a quarter of a teaspoon of salt in a bulb syringe or neti pot will work. Remember to flush one side first, tipping the head to the side over a basin or over the sink. Gently flush the upper nostril and let it flow out of the lower nostril. Repeat the procedure with the other nostril, tipping the head to the other side. Also remember to use distilled, boiled or purified water when using nasal washes and to clean the neti pot before and after each use to minimize accidental contamination. Steam can clear clogged or congested sinuses. Put a pot of water to a boil on the stove and slowly and gently breathe in the resulting steam. Use caution, however, as steam can cause mild to moderate burns. If it feels hot after breathing the steam in, pull back some and inhale more slowly. There are a lot of home remedies that people sometimes take for granted, but when used properly and regularly, the truth is that they often do work - and often work well. Not only that, but these natural remedies are also inexpensive and easy to find. These everyday items help fight off the colds and flu as well as keep the body fit and healthy.